I visited the Rockefeller Archive Center to research the William H. Whyte papers for my doctoral dissertation, "Transactional Terrains: Partnerships, Bargains and the Postwar Redefinition of the Public Realm, New York City 1965-1980," that traces the architectural and urban history of the privatization of the public realm. At the center of the research is New York City during the "urban crisis" years of the 1960s. The period saw an ongoing shift in how city and state governments initiated, financed, and managed architecture and urban development. As an administrative apparatus of crisis management, the public-private partnership was the fiscal and legal device that was at the center of this shift. With the public-private partnership, there was an increased emphasis on transactions between jurisdictional authorities and private sector actors. The 1960s witnessed the beginnings of organized cultivation of private sector participation by city and state governments, in the funding, management, and provision of public goods (parks, plazas, and housing). By examining the ecology and economy of these public-private partnerships, the dissertation seeks to examine the privatization of the public realm in New York City as a series of complex intersections between the city's economic, political, urban, architectural and real-estate histories beginning in the 1960s. 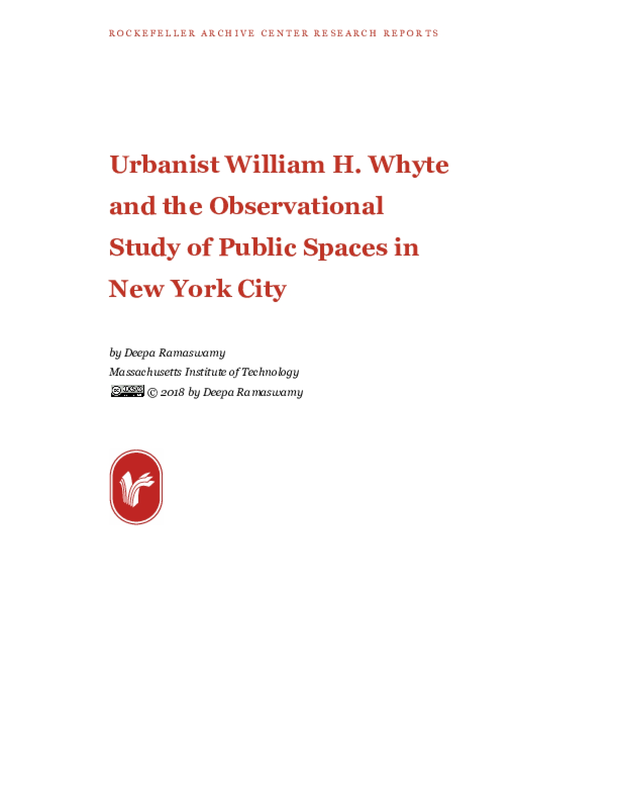 Urbanist William H. Whyte's writings, research, and speeches on the design and value of public spaces in New York City have shaped policy and theory in architecture, urban design, and planning since the early 1960s. He was a prominent figure, specifically for my first chapter.